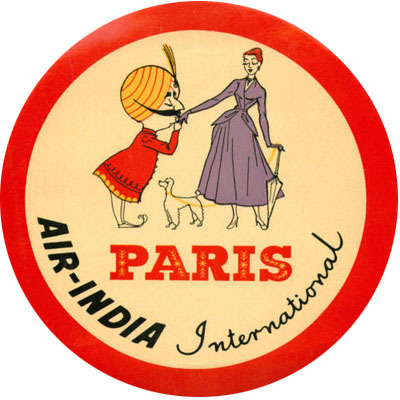 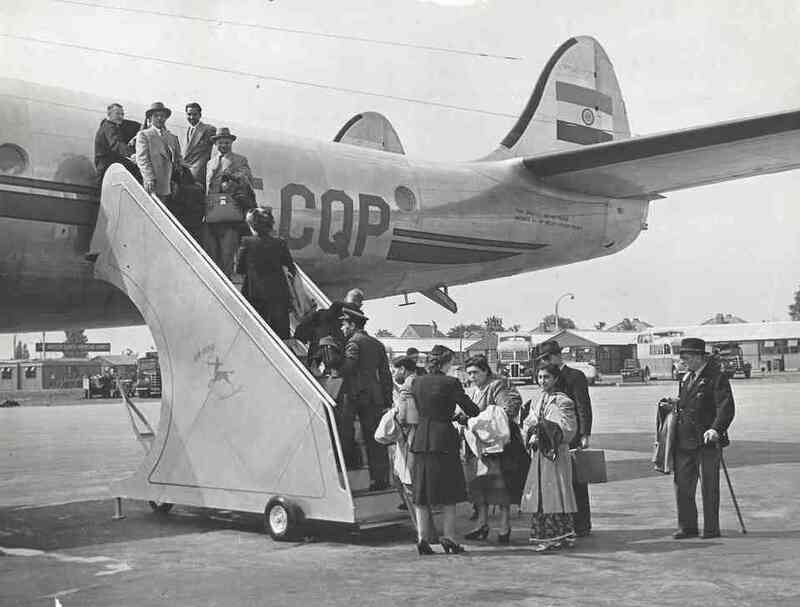 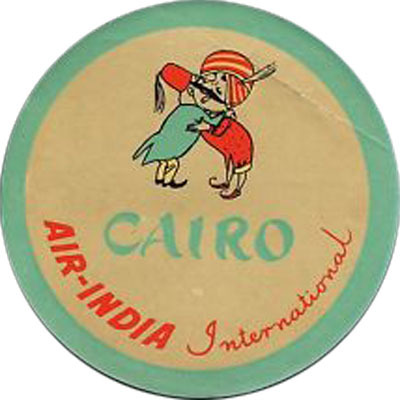 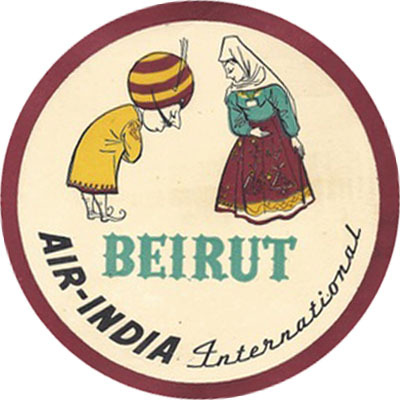 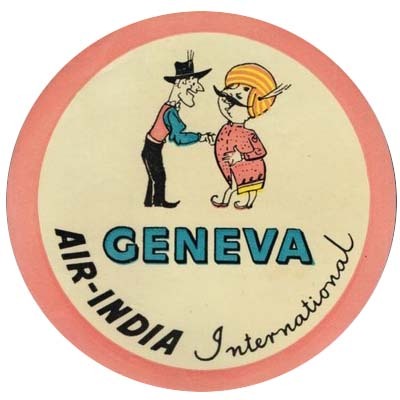 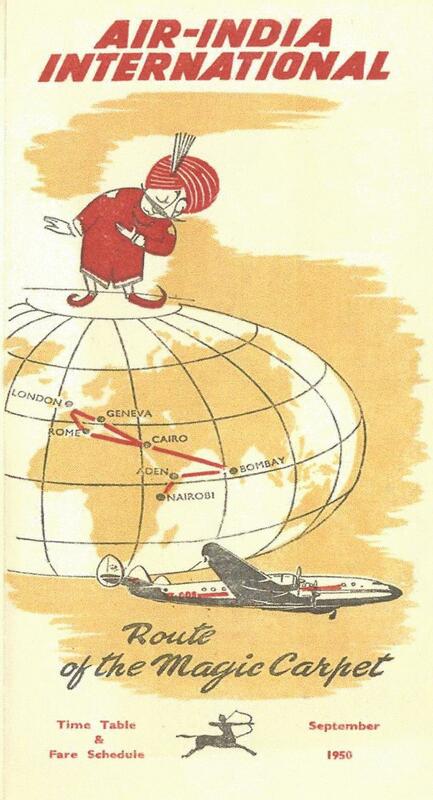 Air-India International inaugurated its Bombay-London service via Cairo and Geneva on 8 June 1948, by Lockheed Constellation Malabar Princess VT-CQP under the command of Captain K R Guzder. 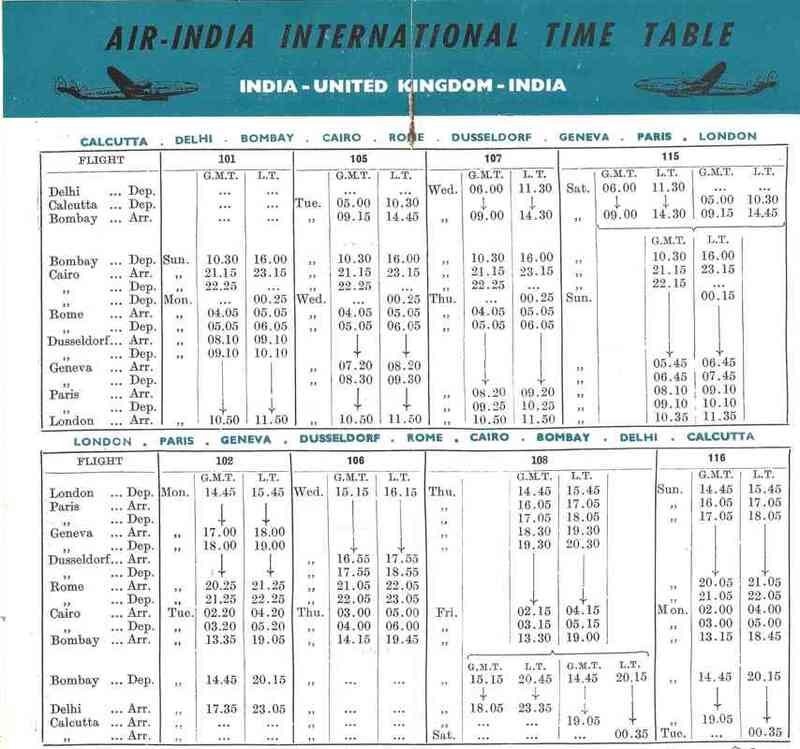 With a schedule of under 24 hours, this was the fastest England-India service. 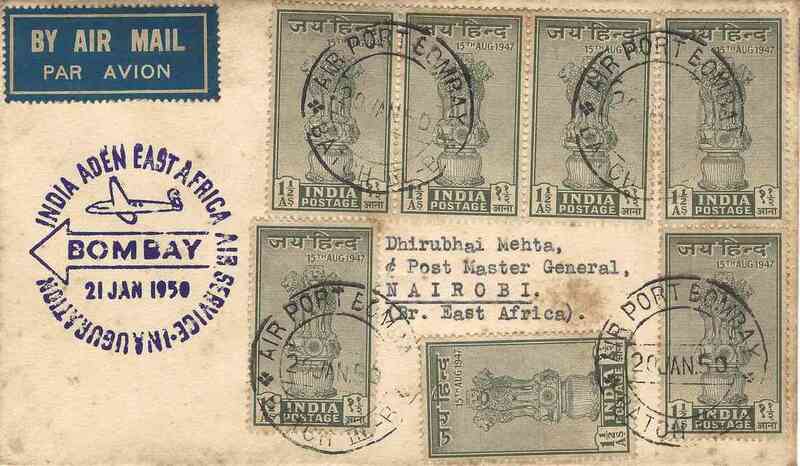 A block of four 12 as value stamps issued to commemorate the first flight from Bombay to London. 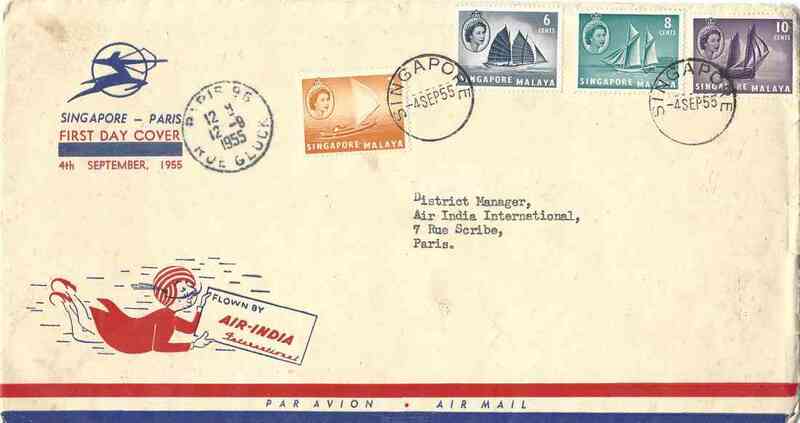 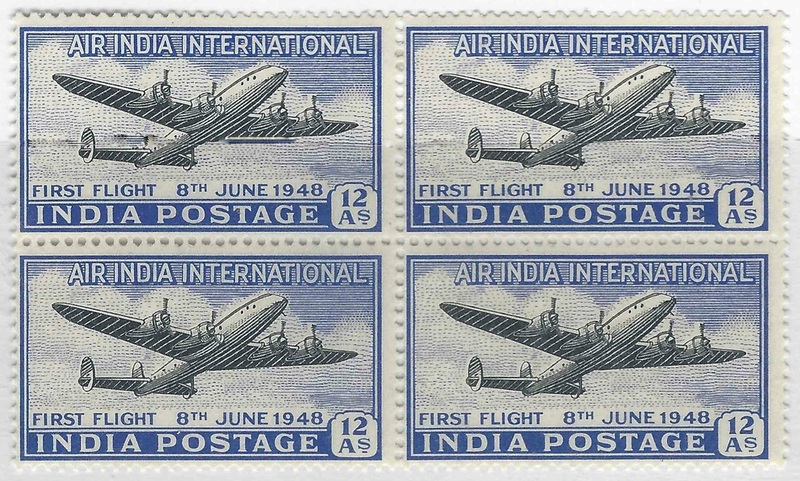 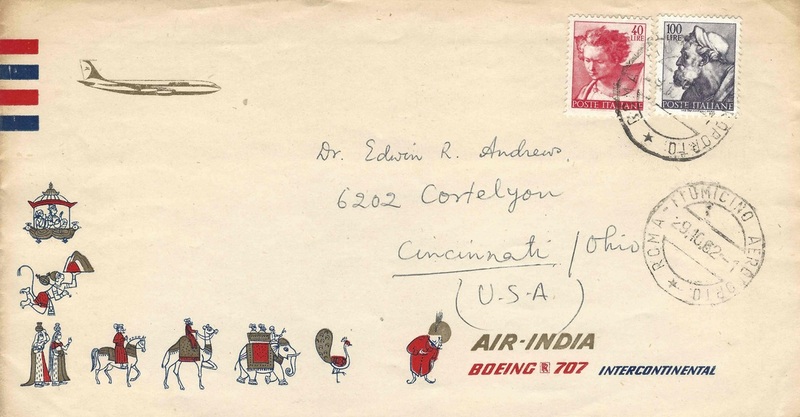 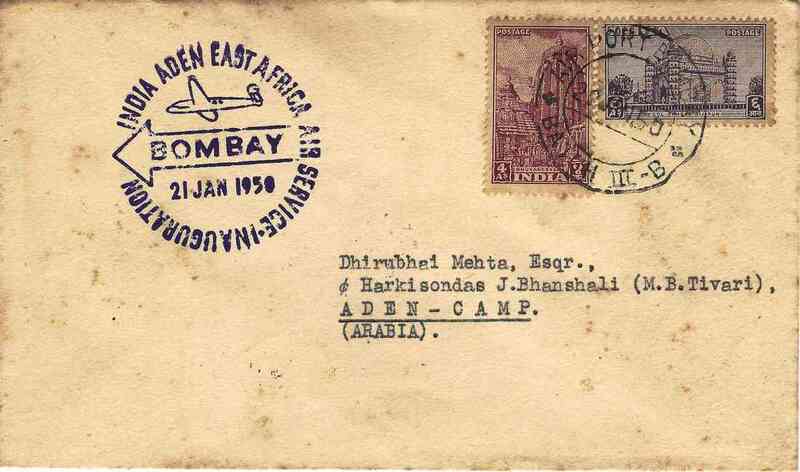 The stamp shows a Lockheed Constellation L-749A Airplane with the legend AIR-INDIA INTERNATIONAL, FIRST FLIGHT, 8TH JUNE 1948, INDIA POSTAGE, 12 AS. 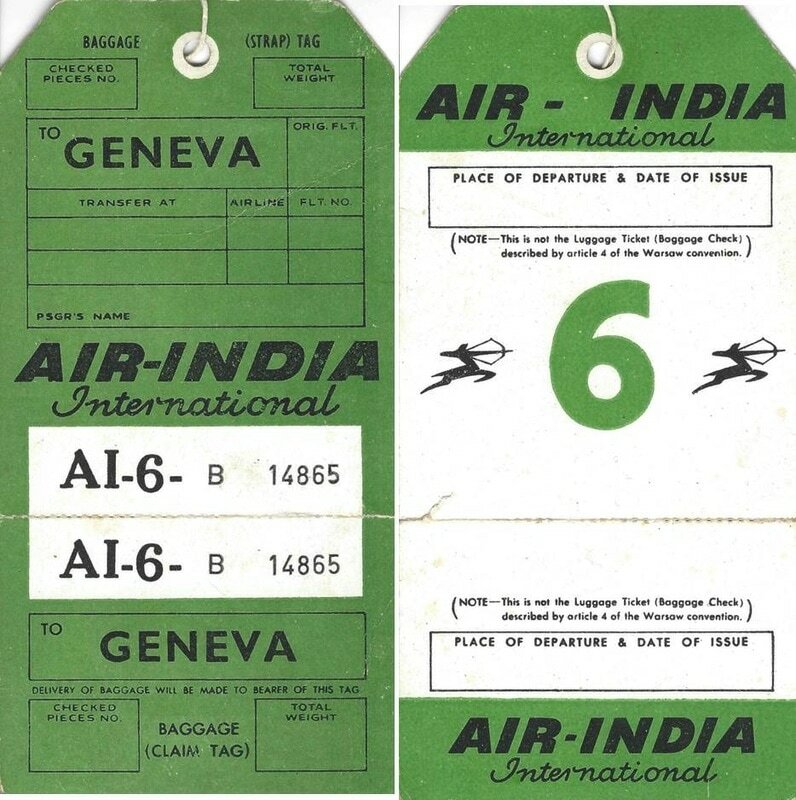 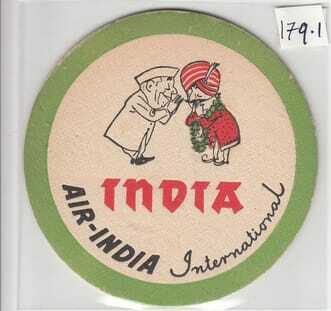 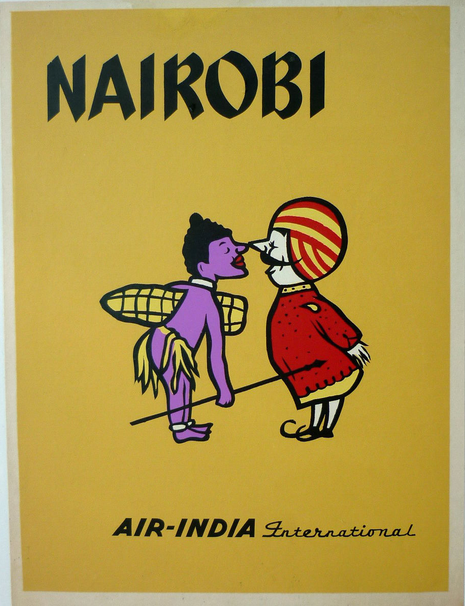 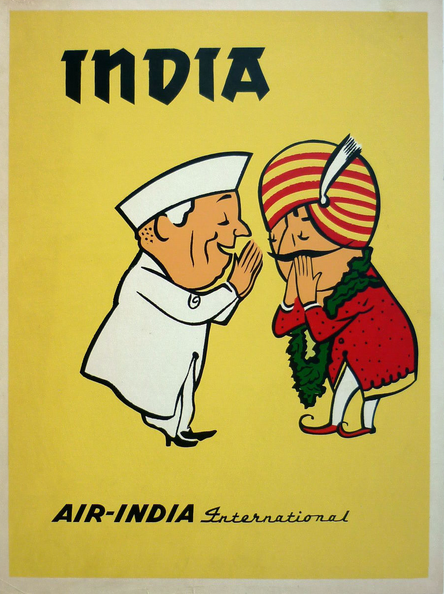 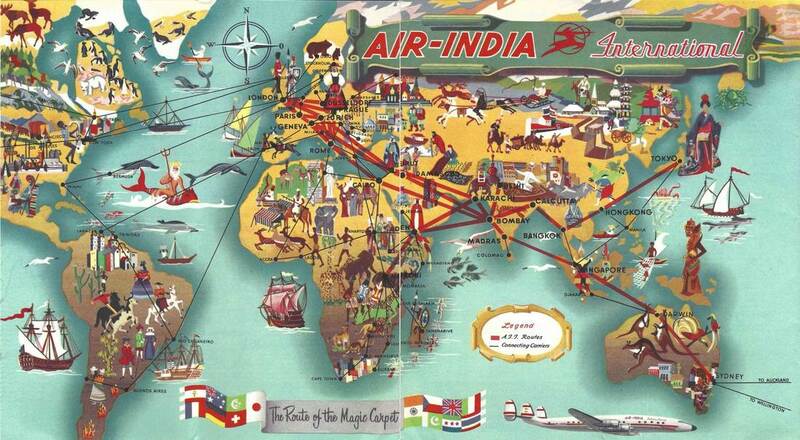 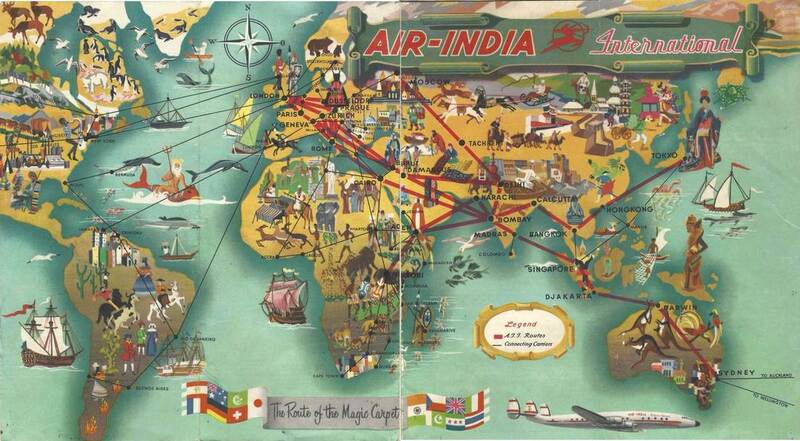 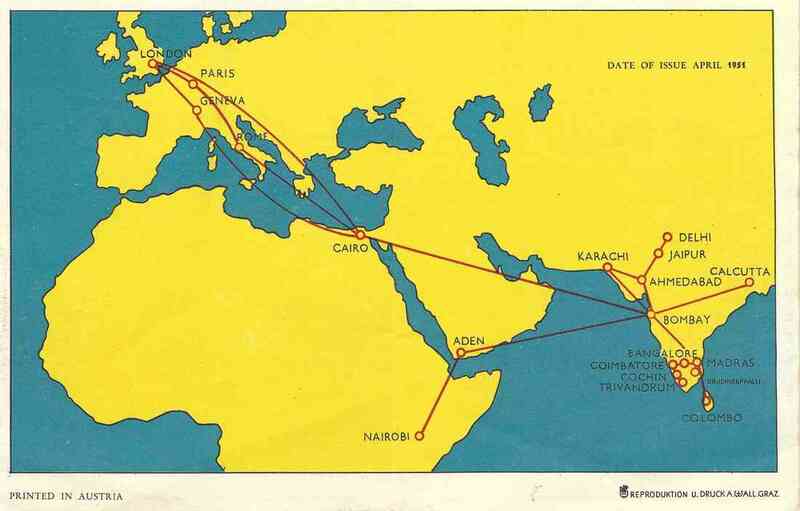 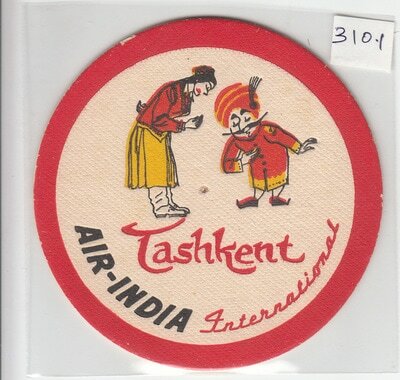 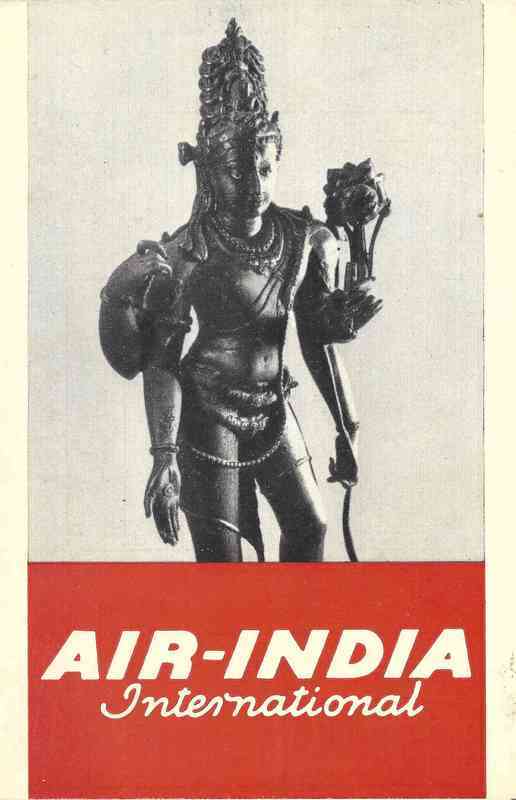 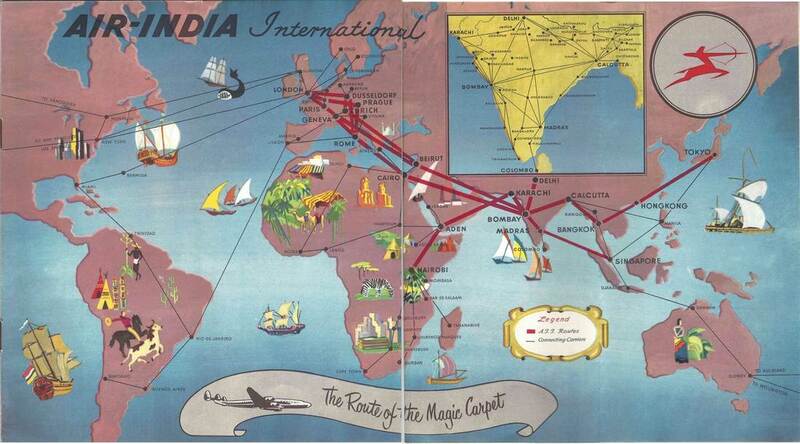 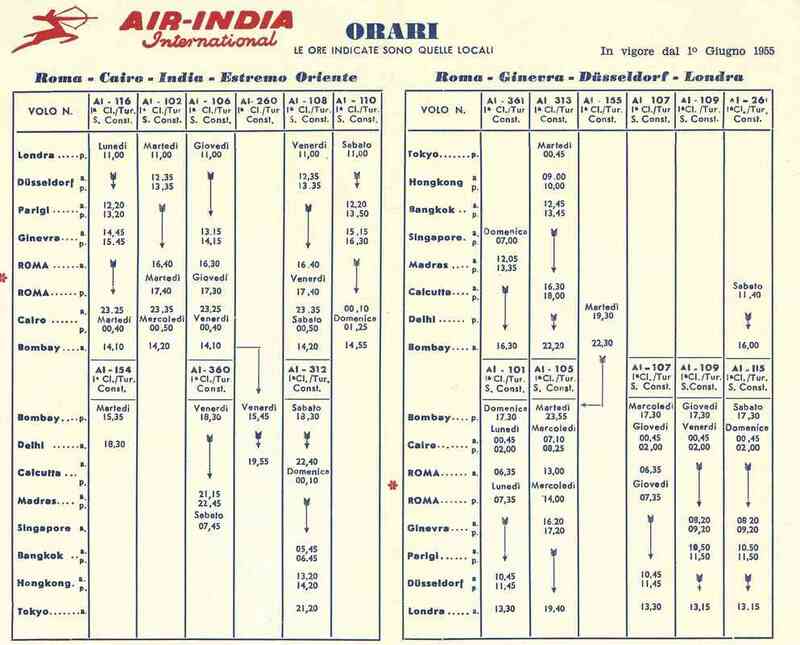 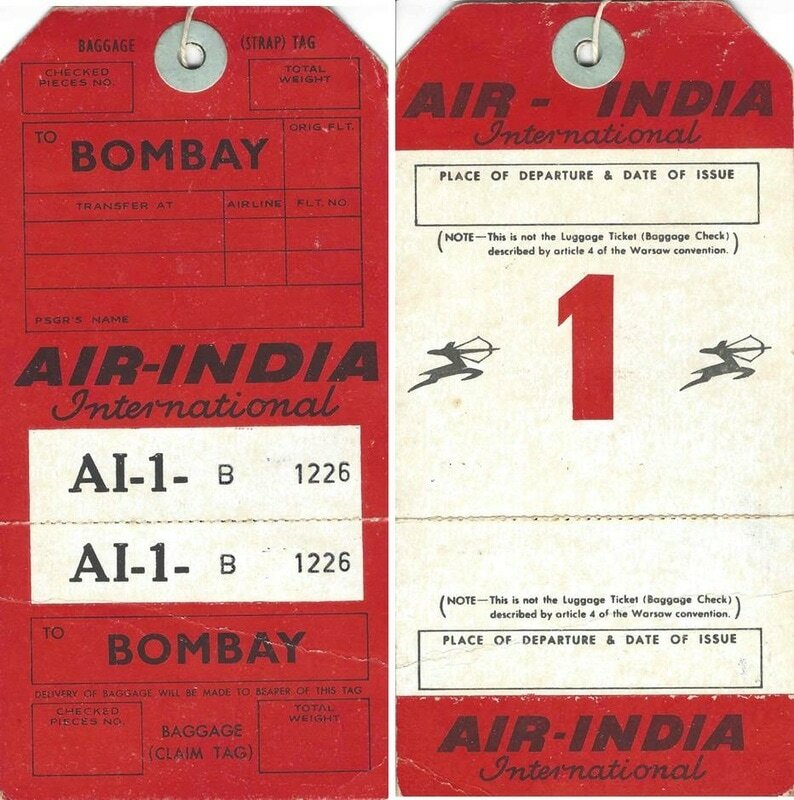 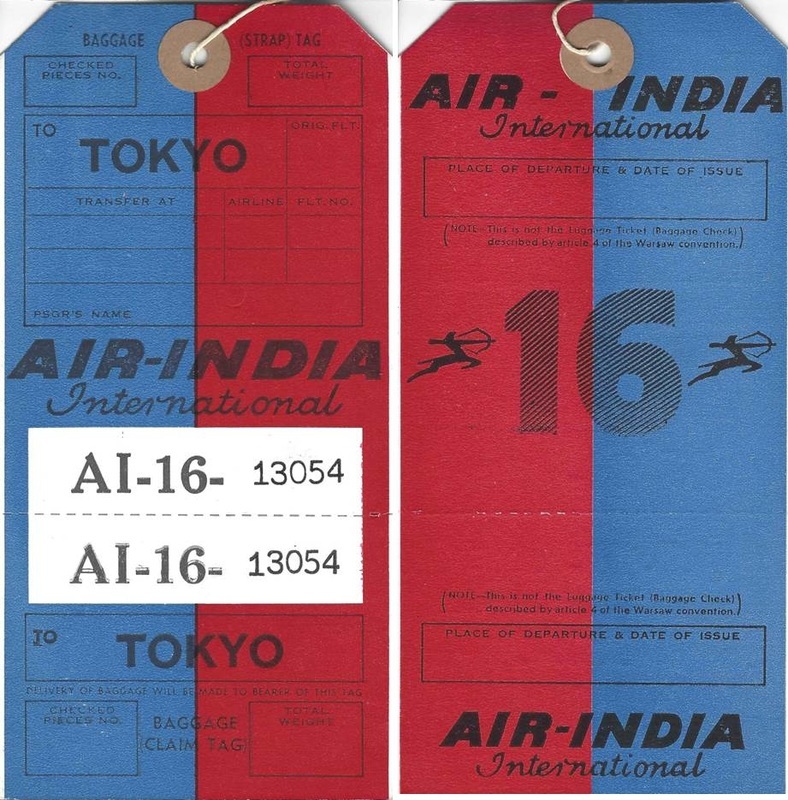 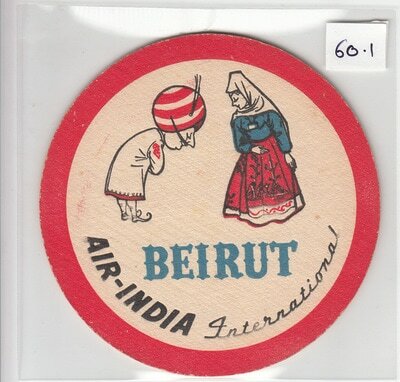 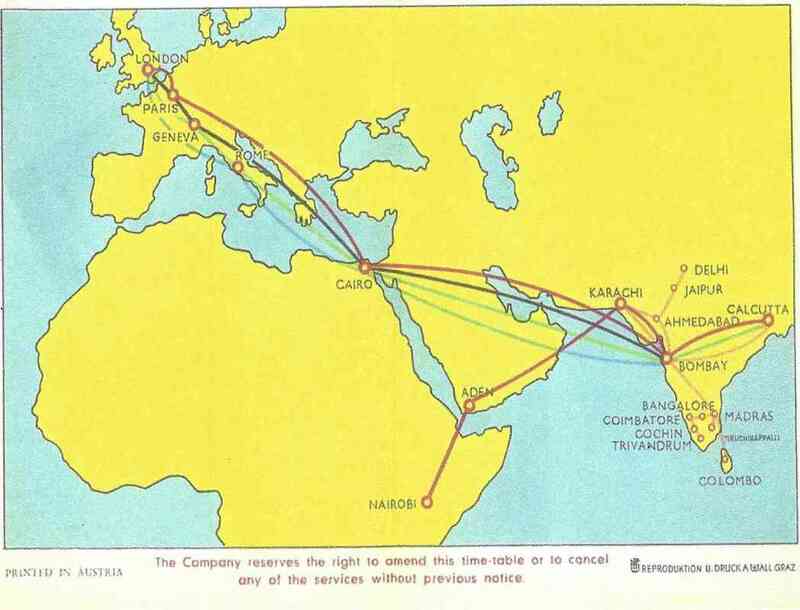 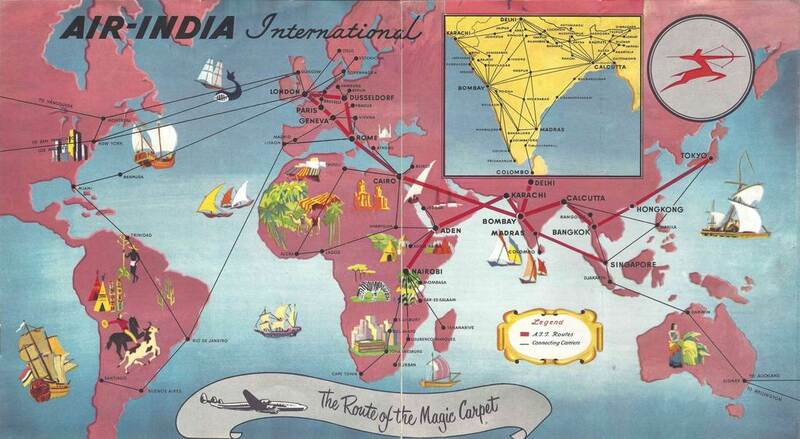 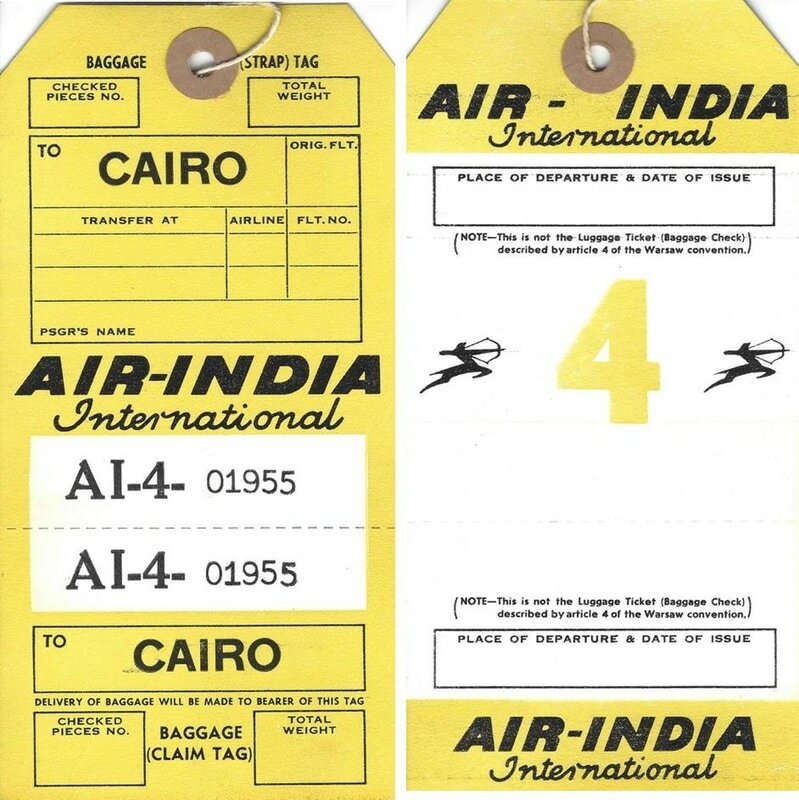 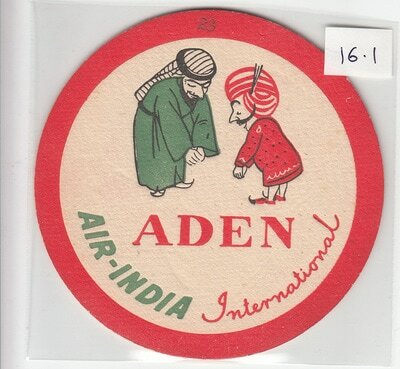 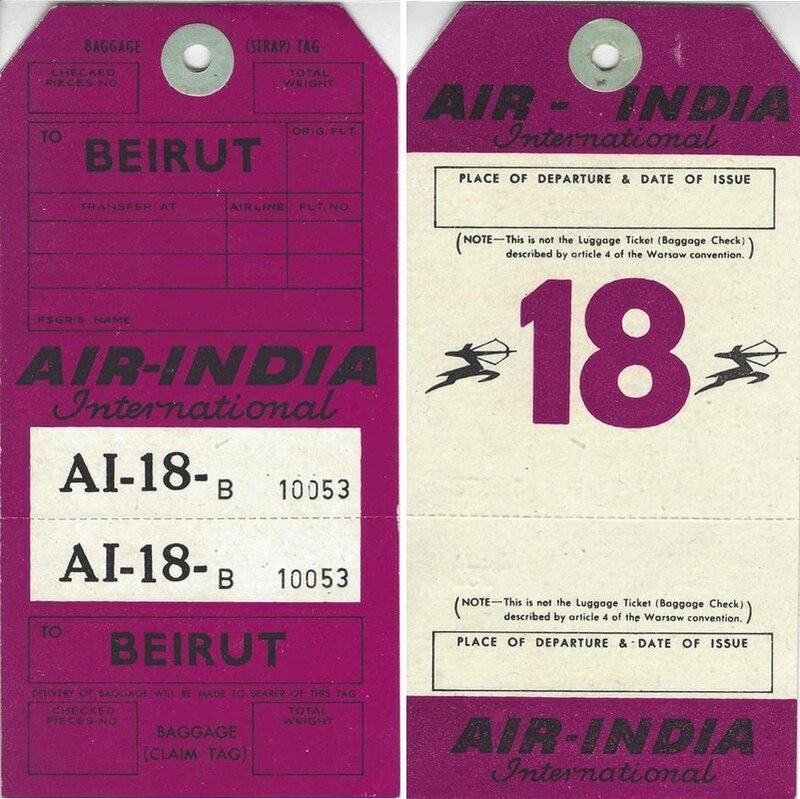 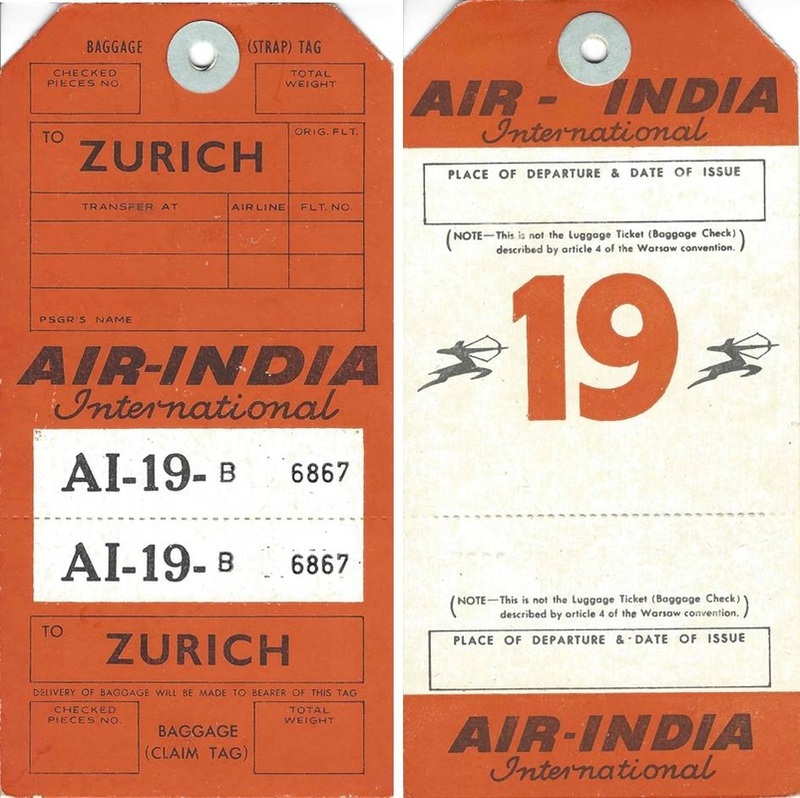 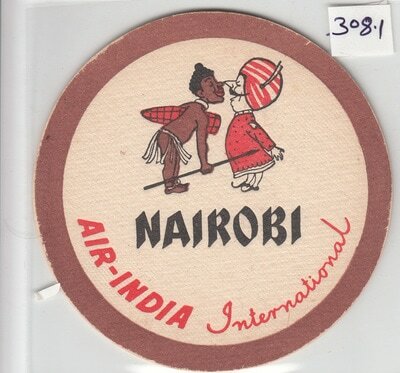 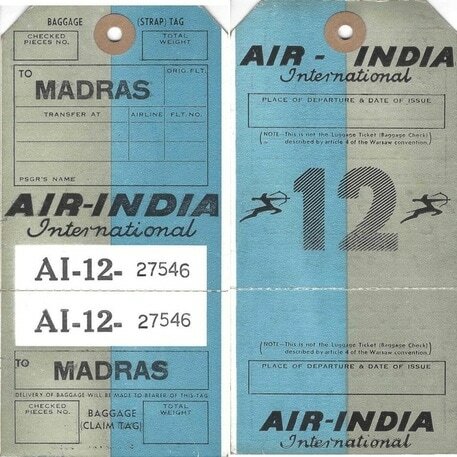 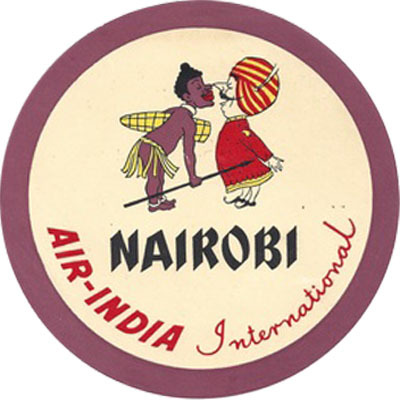 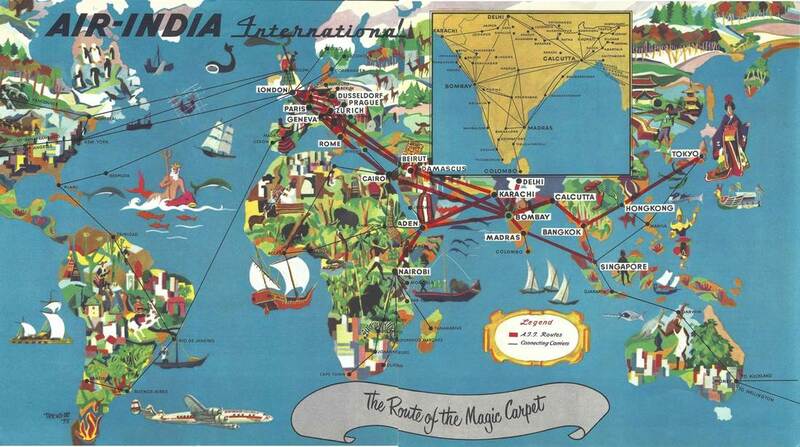 ​Air-India began a fortnightly service Bombay / Nairobi via Aden using Constellations. 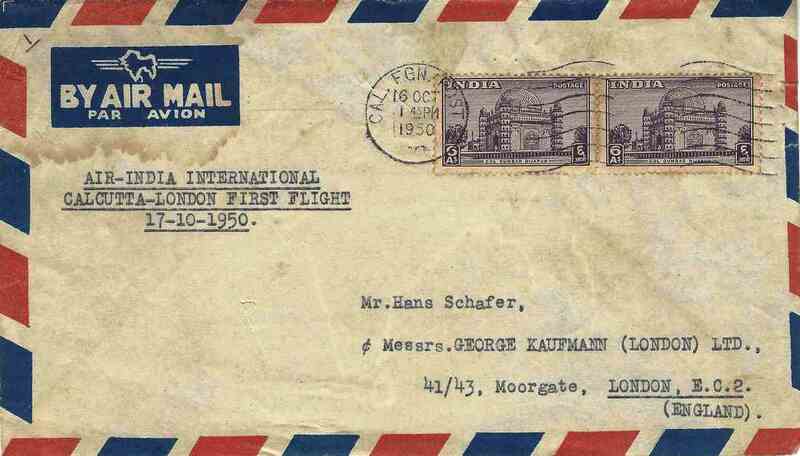 12th March 1950. 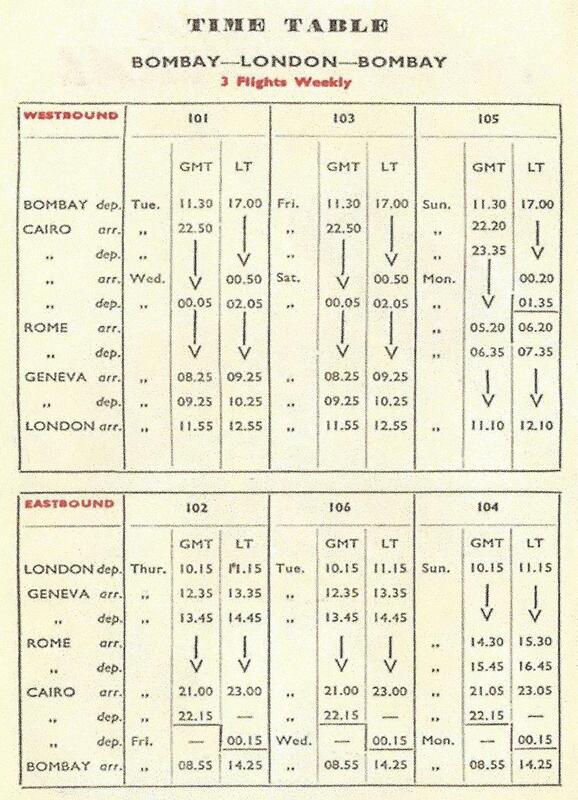 ​Rome introduced as a halt on the U.K. route. 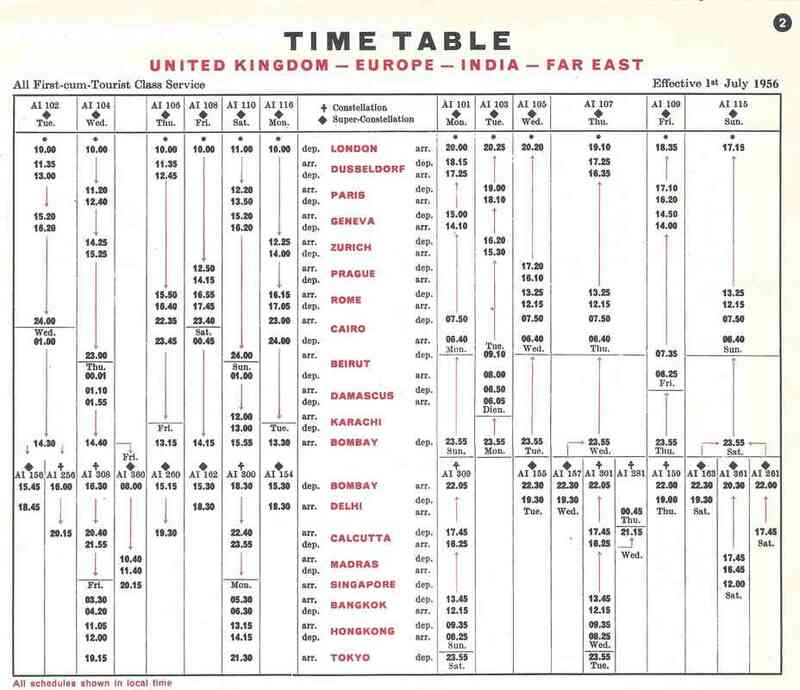 ​On 26th July, 1950 Karachi introduced as a halt on the Bombay / Nairobi service. 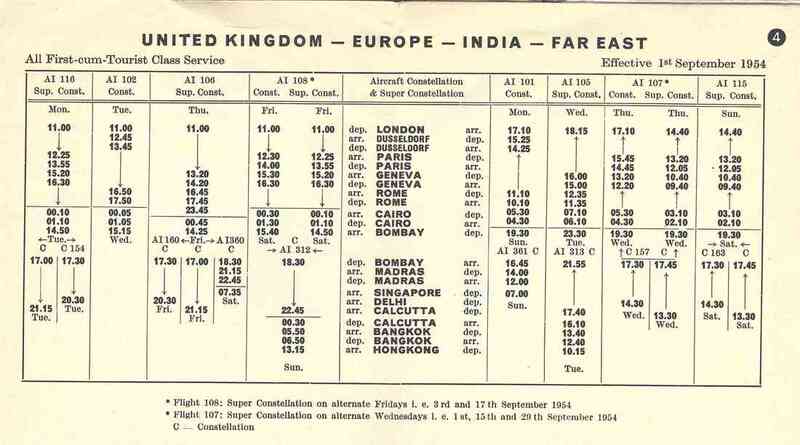 On 15th October, 1950 Bombay / London route extended through Calcutta. 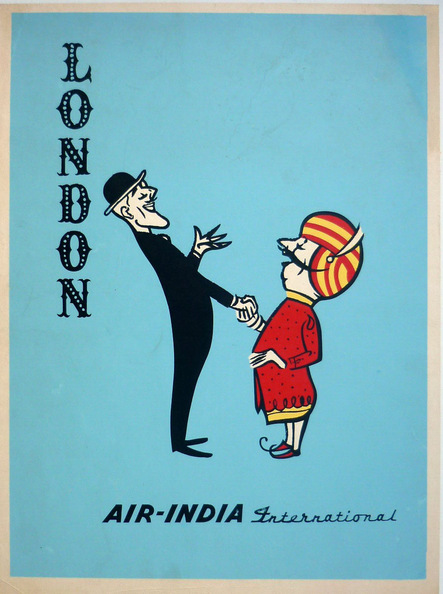 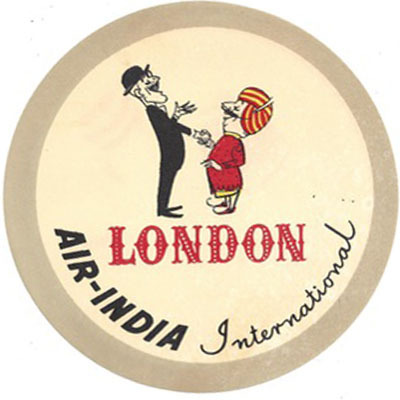 Air-India increased the frequency of its India-UK flights to four per week and, from 17 October, extended two services a week from Bombay to Calcutta. 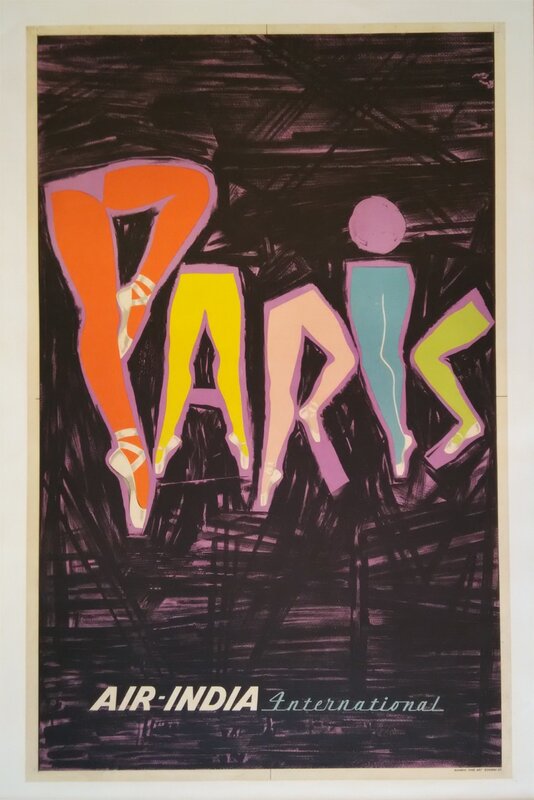 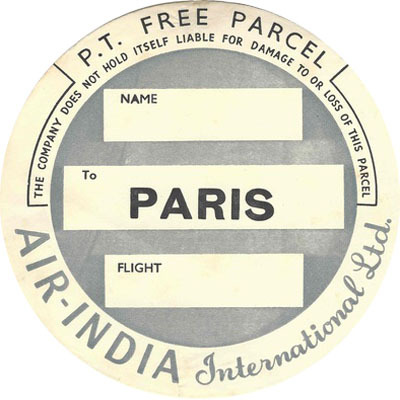 On 7th April, 1951 Paris introduced as a halt on the U.K. route. 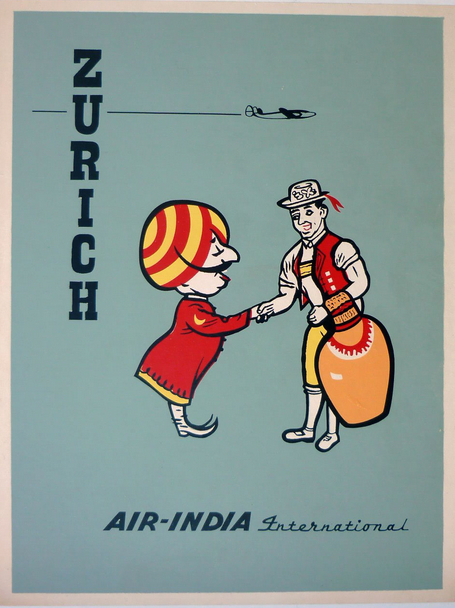 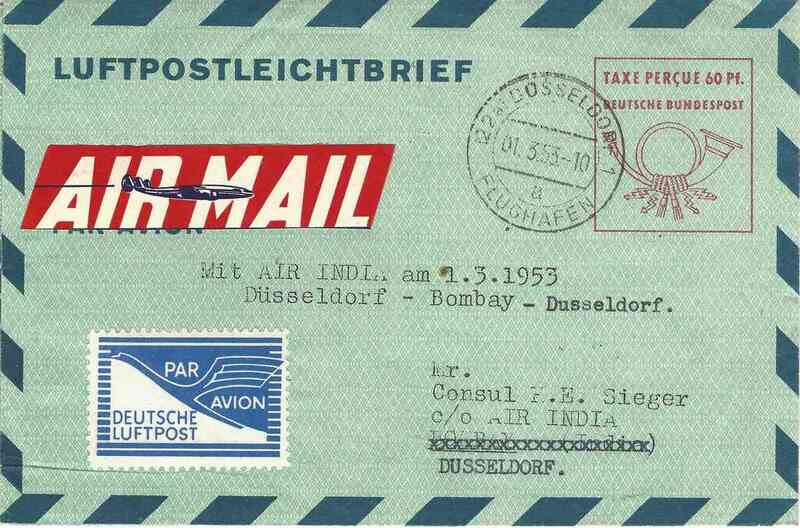 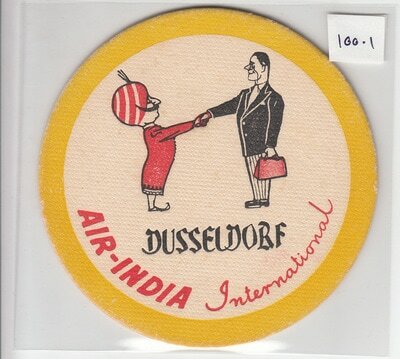 On 21st Feb, 1953 ​Dusseldorf introduced as a halt on U.K. route. 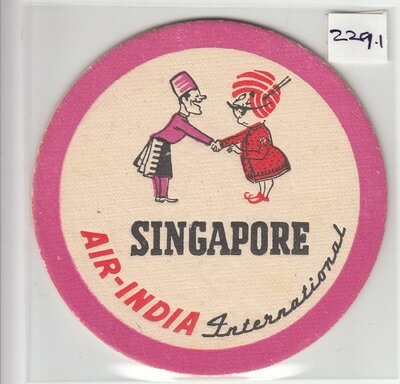 on 16th July, 1954 Inaugural flight Bombay to Singapore via Madras with L-749A Constellation VT-DAS on once a week basis. 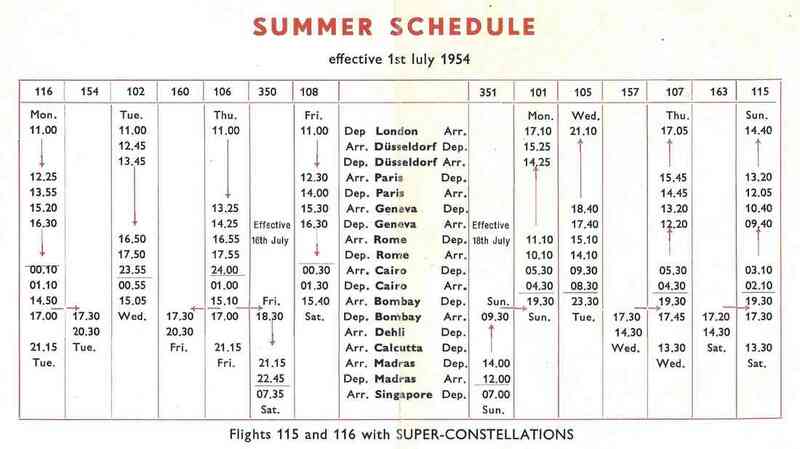 On 14th August, 1954 Bombay to Hong kong service launched via, Calcutta & Bangkok. 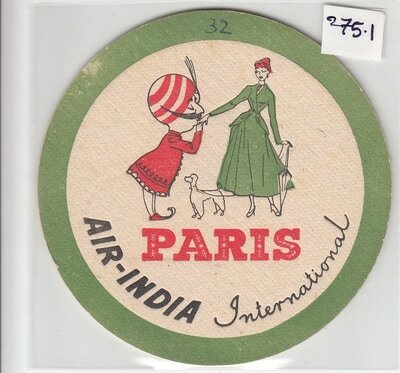 ​The flight was by Himalayan Princess VT-DAS via Bombay, Calcutta, Bangkok and Hong Kong. 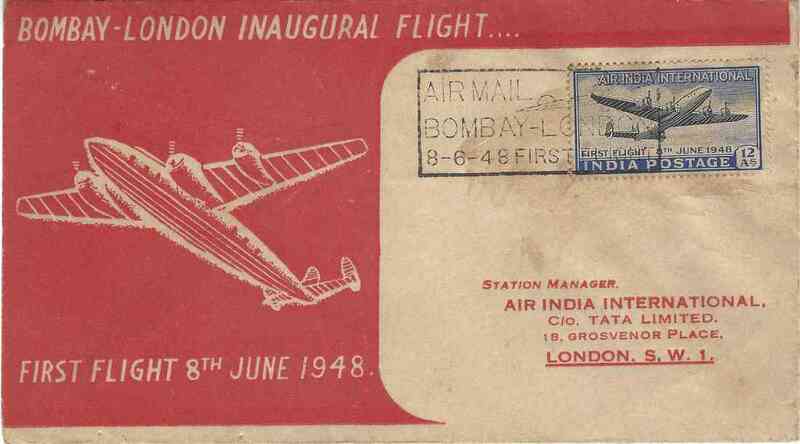 The pilots were Captains H B Mistry and R N Goday. 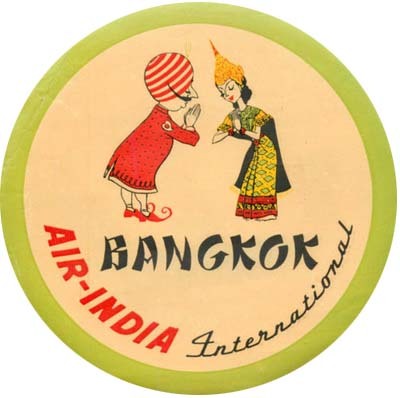 The flight was by Maratha Princess VT-DAR via Calcutta, Bangkok and Hong Kong. 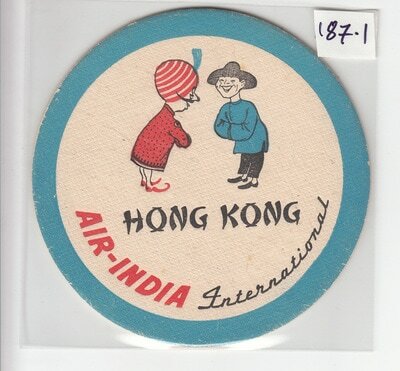 This was an extension of the Bombay-Hong Kong service inaugurated on 14 August 1954. 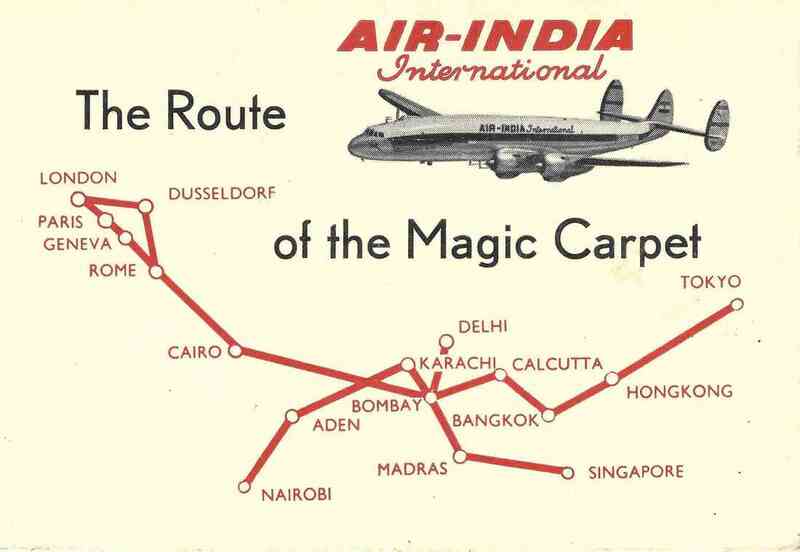 Map for the route found from the August 1955. 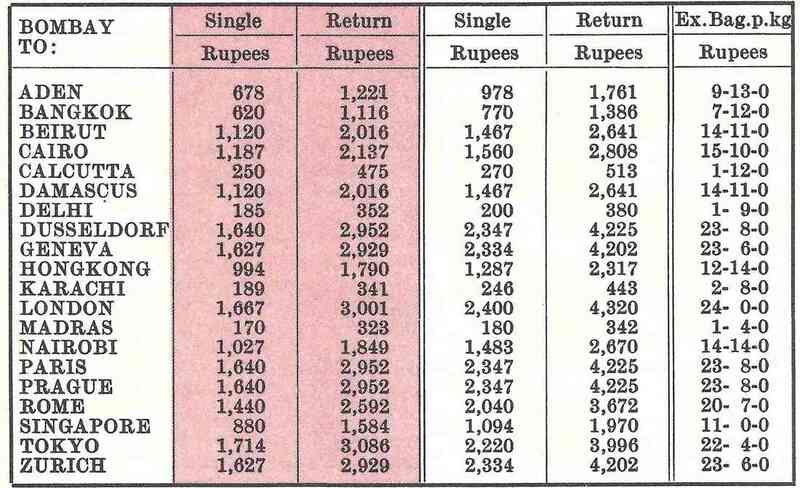 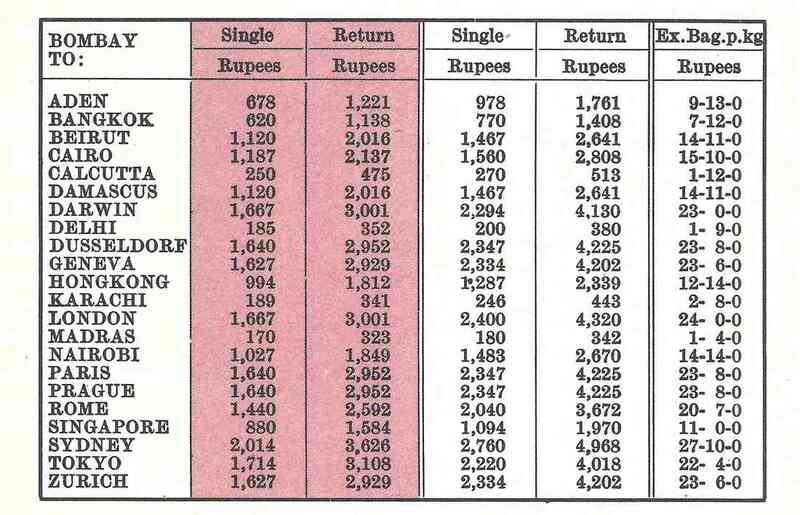 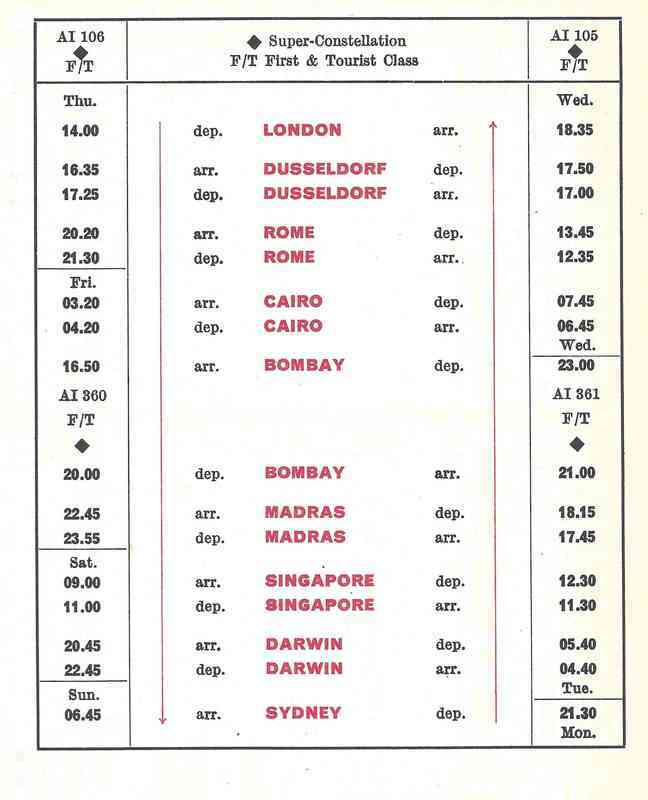 Fare rates found from the August 1955. 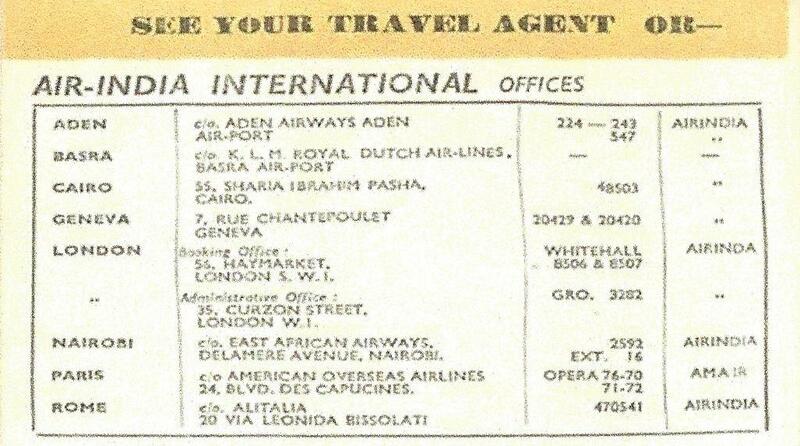 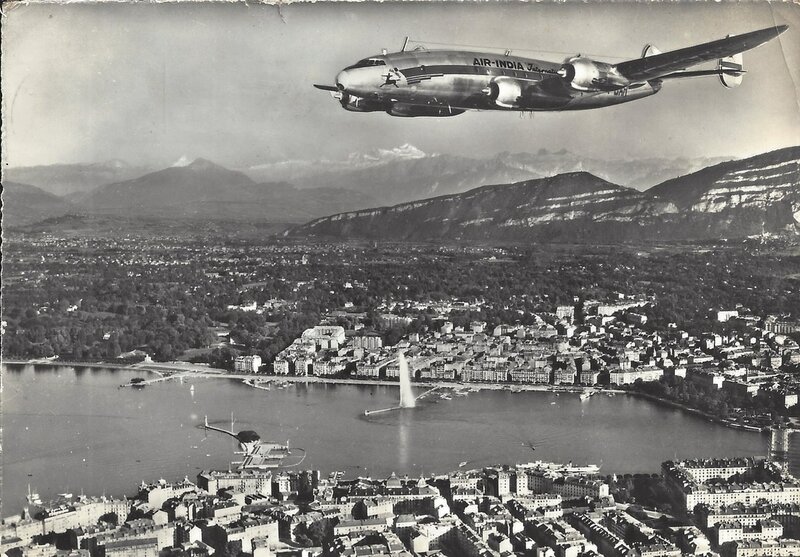 On 4th July, 1955 Beirut and Zurich Introduced as a halts on the U.K. route. 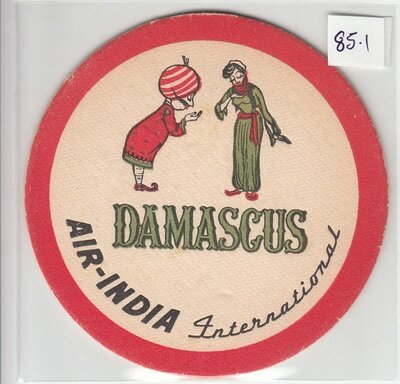 On 3rd April, 1956 ​Damascus introduced as a halt on the U.K. route. 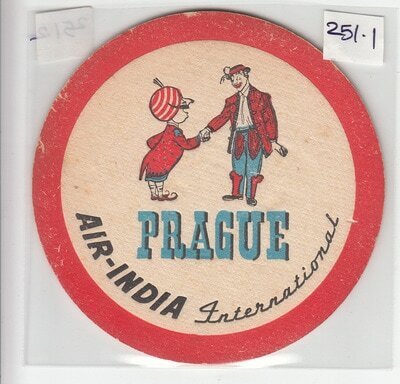 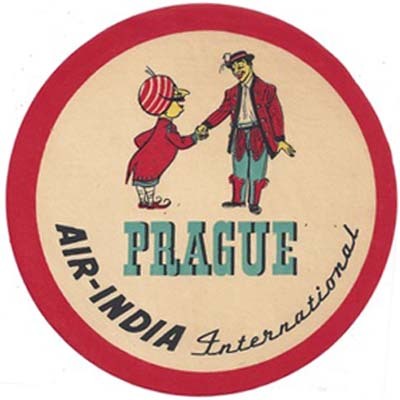 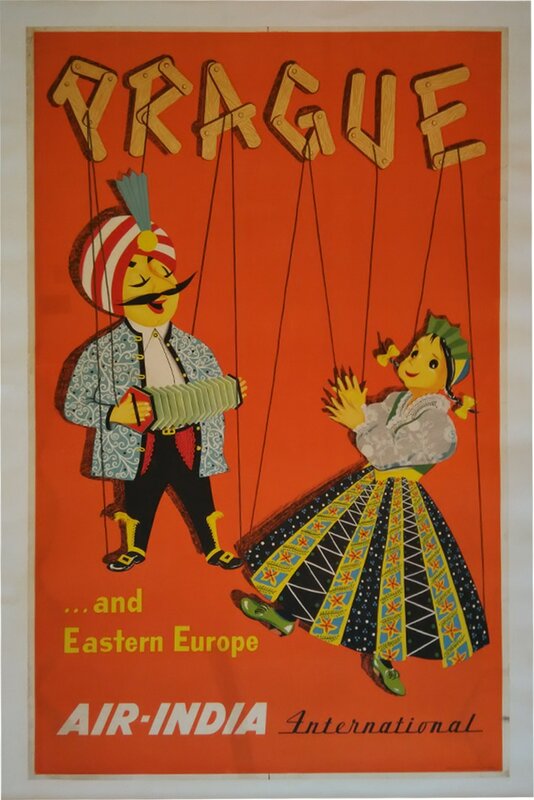 On 4th April, 1956 ​Prague introduced as a halt on the U.K. route. 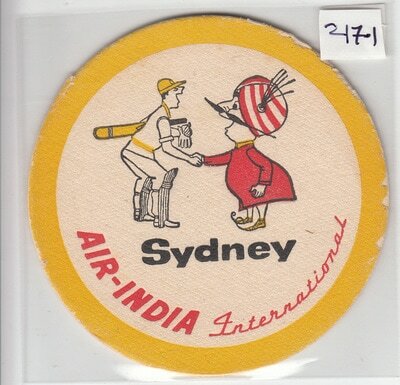 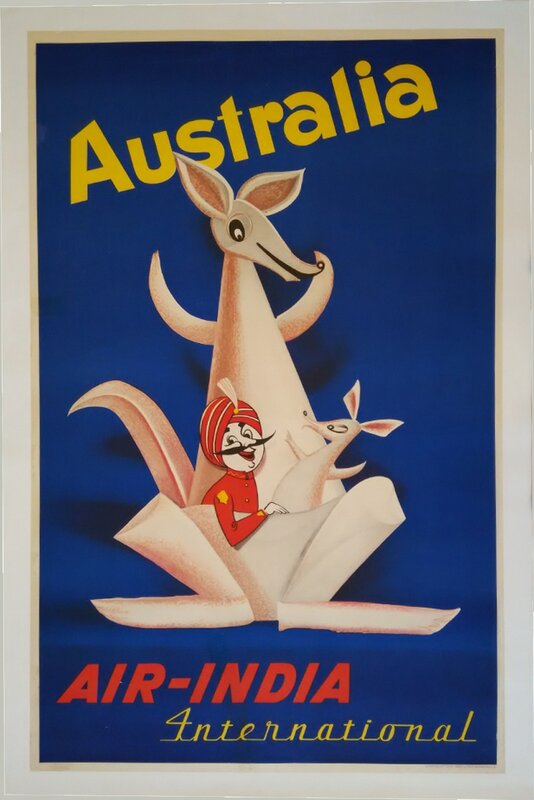 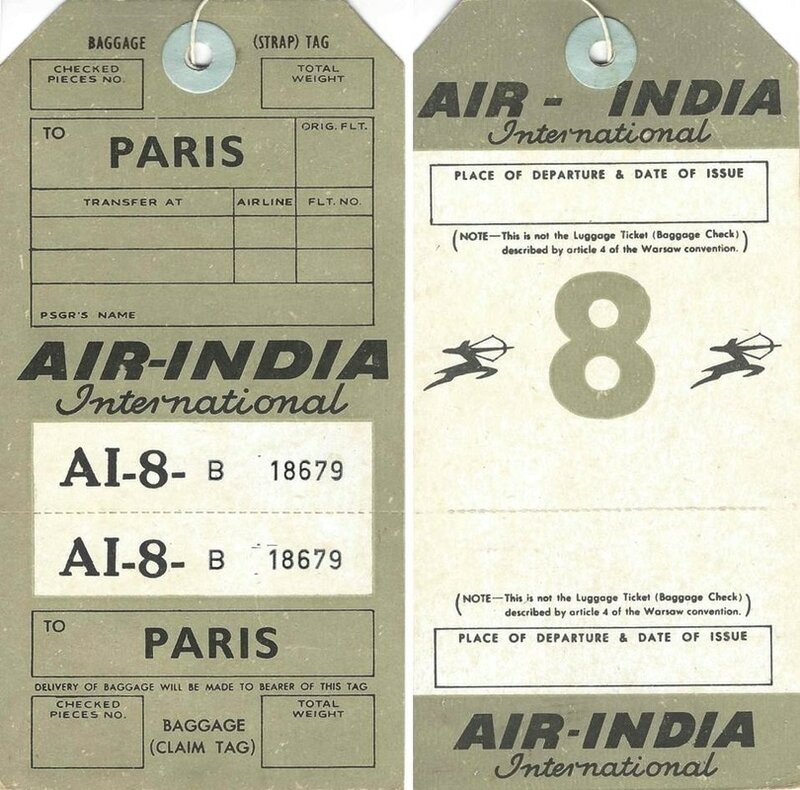 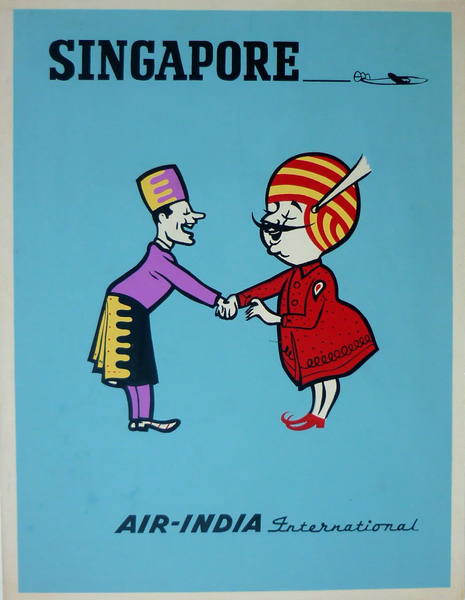 On 5th October, 1956 Air-India International extended its Bombay/Singapore services to Sydney, via Madras, Singapore & Darwin. 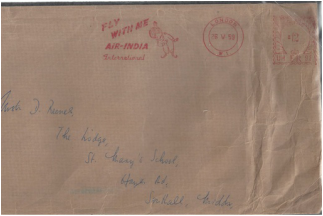 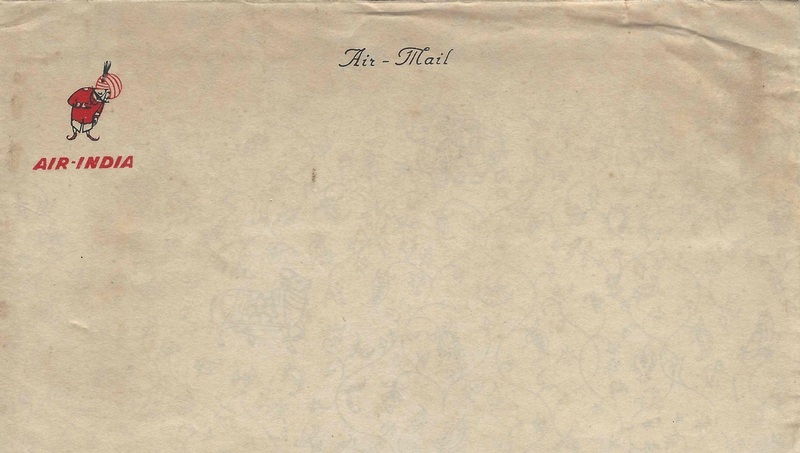 The first flight to Australia was by Rani of Nilgiris VT-DIL. 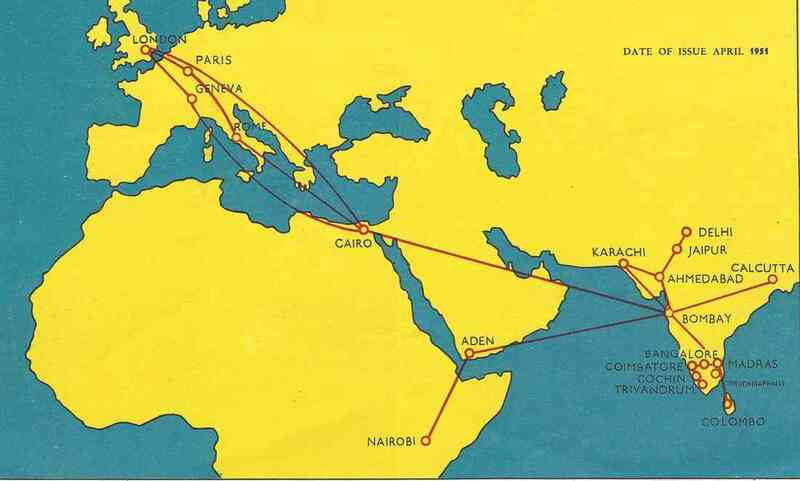 The route was via Madras, Singapore and Darwin. 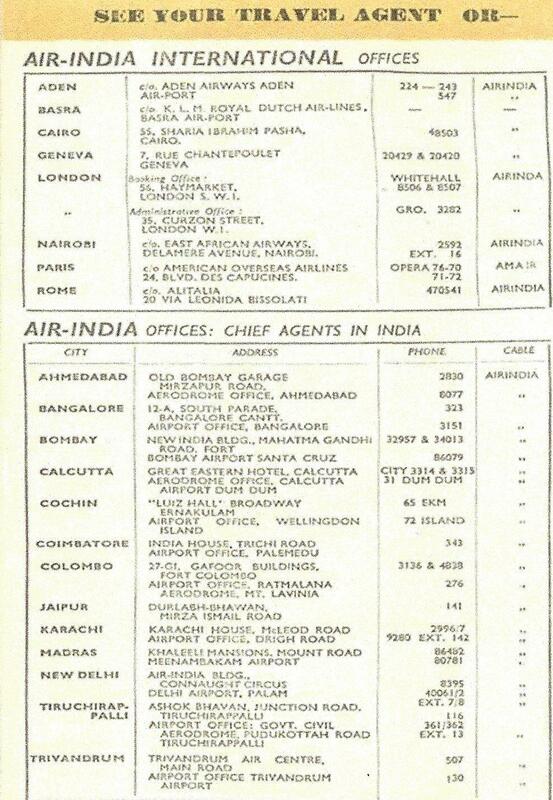 Captain H B Mistry flew to Singapore and Captain K Mathen from there to Sydney. 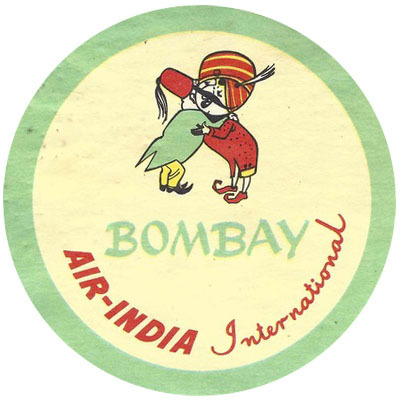 The first proving flight over the route left Bombay on 2 September 1956. 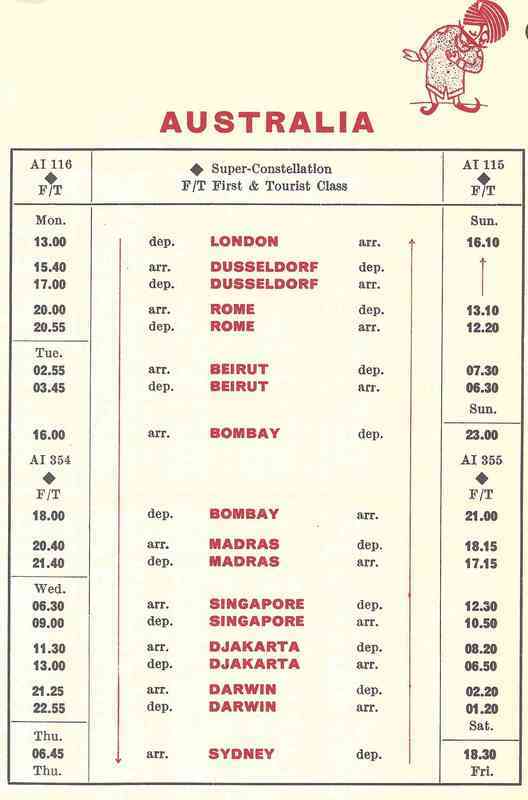 On 4th January, 1958 Jakarta introduced as a regular halt between Singapore and Darwin on Sydney route. 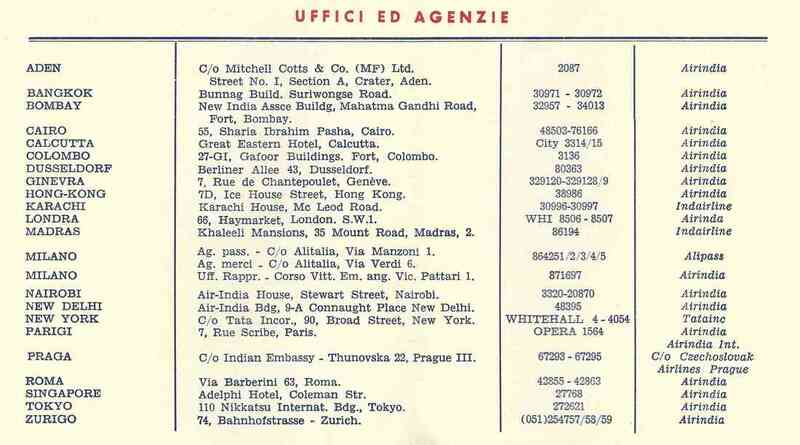 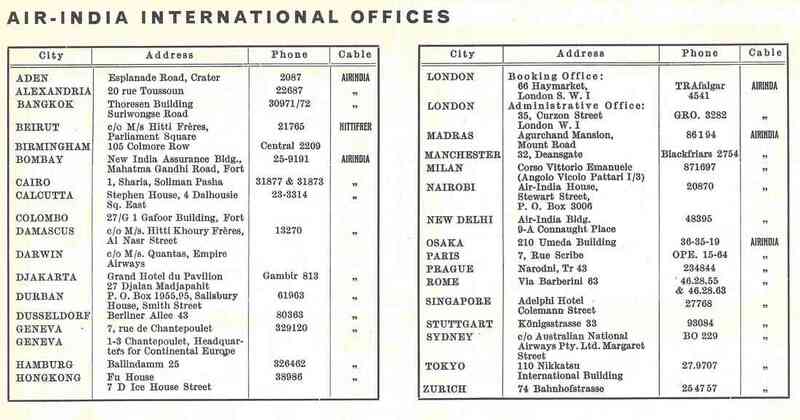 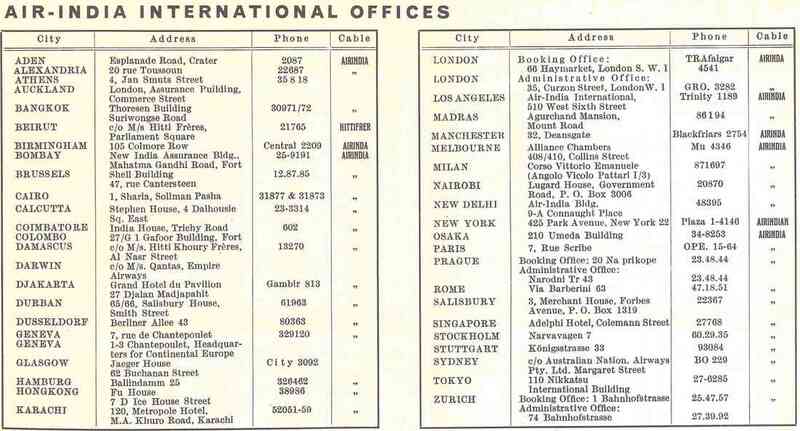 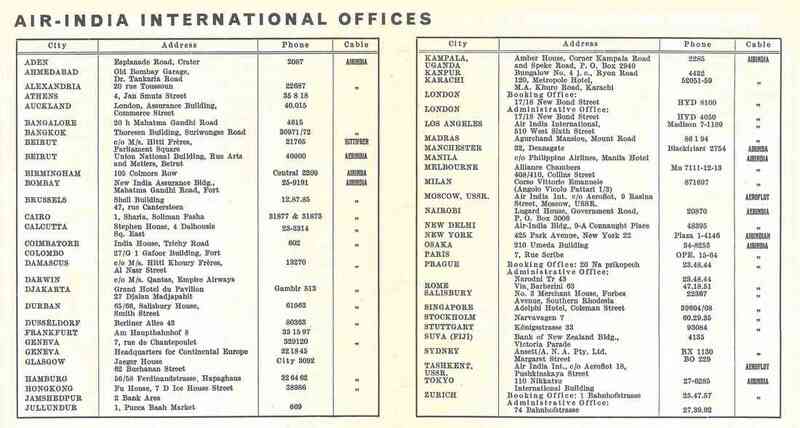 Office Location found from time table October 1958. 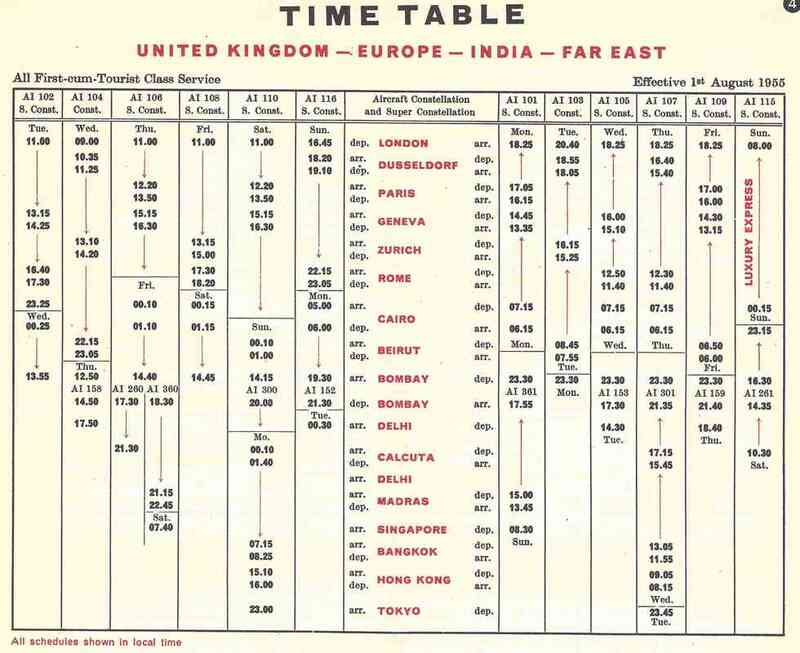 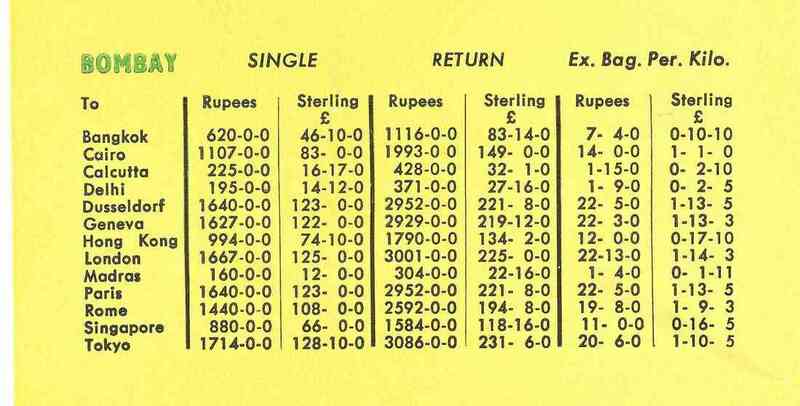 Fare rates found from timetable 1st December 1958.